You know you’re in trouble when the creepy occult guy you’re doing business with suggests that you try a more traditional method of revenge rather than summon the ancient demon of vengeance that you’re paying him lots of money to do. But the mystery man in the movie insists on using the demon and after a little bloodletting, Killjoy appears. But he demands more blood as not only is he only partially formed (his hair is gone, revealing a nasty set of horns), but he also wants some helpers this time around. Using aspects of other demons, he creates: Punchy the boxing hobo clown (Behemoth), Freakshow the Kuato twin mime (Gemini) and Harley Q…er…Batty Boop (succubus). But the revenge-seeker vanishes before the necessary sacrifice and the demonic clowns are sucked into a mirror. I’ll admit it, I really wasn’t looking forward to watching Killjoy 3. I remember having my enjoyment of a promotional video from Full Moon being dampened by the clearly SOV clip from the first Killjoy appeared and drastically contrasted with the quality of the other clips. I recall the near-universal hatred of the films back when they first came out and I’ve always associated the character with the sort of cheap, “farmed out to an other production company” films from the dark days of Full Moon’s near death. But to my surprise, Killjoy 3 wasn’t that bad. In fact, it’s easily the best entry in the Killjoy franchise. Granted, that’s hardly the greatest of achievements, but it does suggest a positive future for the series should they continue making installments. Ever wondered how a clown-themed demon with a relatively modern name could be an ancient demon of vengeance? It’s actually explained in this film, with the revelation that Killjoy has appeared under many names and forms in the past, with his Killjoy personae being the most recent. There’s also some stuff about how belief creates demons which, although never explicitly stated, could explain how Killjoy went from being the result of a black magic ceremony involving a toy in his first appearance to being an apparently well-known ancient evil in the second film. But there are plenty of problems mixed in with the good stuff throughout the film’s 78 minute running time. Even though Killjoy and his cohorts are clowns, most of the humor isn’t actually funny. The attempt at doing a live action of the Looney Tunes referee routine is particularly painful. I only recall laughing at some Rocky references during a boxing scene and Killjoy’s reaction to a character’s bargain is a scream. Come to think of it, the sequence where Zilla tries to convince Punchy to rebel against was pretty amusing (and clever, to boot). It’s a shame, as the actor who plays Killjoy (Trent Haaga) is a very talented and funny guy. It’s a shame that he didn’t write the script (or was given complete freedom to improv), as the end product would probably be a ghoulish laugh riot under those circumstances. But the lack of genuine laughs isn’t the only problem. Despite the constant references to Zilla’s childhood in the movie, no background is ever given. Instead, his background as an awkward nerd who bulked up and became a star football player is briefly mentioned in the making-off segment. Another scripting oddity is the mirror world itself. At first only a person’s soul enters the mirror realm, but later people are actually transported there. While the members of Killjoy’s posse are somewhat interesting, they’re treated as being largely disposable by the film, especially towards the end. Another aspect of the characters that annoyed me was the handling of the “created from aspects of other demons” origin given to them. The Behemoth one was fine, but the Gemini twins can hardly be considered demons and would it have really killed the scriptwriter to visit Wikipedia to actually get a succubus name? The widescreen transfer and audio are both excellent. I was very happy to see that this didn’t appear to be shot on video like the original. There were some moments where the visuals seem dull, but the behind-the-scenes featurette seems to imply this was actually an intentional choice using a fog machine. 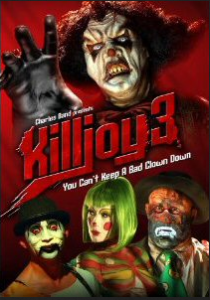 Speaking of which, “Killjoy 3: Behind the Scenes” consists of a series of promotional Youtube vidcasts that were made to promote the movie while it was being filmed in China. We get to see parts of the movie being filmed, the Chinese crew building the set, actors talking about their roles (watch out for spoilers) and the like. The main attraction is Trent Haaga, who hosts many of the videos while in full costume (and in character). He really hams it up as our personal tour guide through the studio and I laughed more throughout the featurette’s roughly 16 minute running time than I did during the entire movie. It also answered my question about how it was for the actress portraying Batty Boop, whose “costume” was merely a wig and body paint. The camera tastefully shows her from the neck up during the application of body paint and she’s seen in a robe between takes. If she hadn’t been pointed out when she appears out of make-up and in regular clothing, I never would have made the connection! Up next is “Killjoy: Vintage Behind the Scenes,” the SOV making-off segment from the first movie. Why was it included? My guess is that it’s here both to reinforce Killjoy 3’s connection to the first film and to show how the franchise has evolved since then. One look at the original Killjoy make-up (and performance by Angel Vargas) drives that point home real quick. Clocking in at just under 12 minutes, it provides a nice mix of clips from the film and behind-the-scenes footage. Everyone involved is incredibly enthusiastic about the film, and the executive producer corrects predicts that there will be a sequel. Rounding out the disc are the trailers, which include Puppet Master: Axis of Evil, Demonic Toys 2, Skull Heads, Oblivion The Haunted Casino and all three Killjoy movies. The one for Oblivion seems to be the original trailer from 1994 rather than a newly made one promoting the DVD release (a nice touch), while Big City Pictures and Tempe are credited in the previews for Killjoy and Killjoy 2 respectively. As was the case in The Haunted Casino DVD, the trailers vary in aspect ratio and quality. Bizarrely, there is no chapter selection menu despite the fact that chapter stops are included on the disc! When I contacted Full Moon about this, the person who responded to me theorized that this was an attempt at “streamlining” the disc. Given that the film was originally only available as part of a Killjoy boxset, it’s not impossible to think that it was treated like a bonus disc and wasn’t given the same treatment as a DVD that had originally been available separately. No matter what the case was, Full Moon should never omit a chapter selection from its DVDs, lest they wish to make their products seem like something from the cheapest of the bargain bin DVD companies. It’s funny to read Trent Haaga’s argument with Lloyd Kauffman at the end of “Make Your Own Damn Movie” about the merits of KILLJOY 2, particularly over the film v. video discussion. It’s good to see Trent getting work and still keeping that sense of humor he had on TERROR FIRMER. This made me rethink the KILLJOY series. I’ll have to track them down.